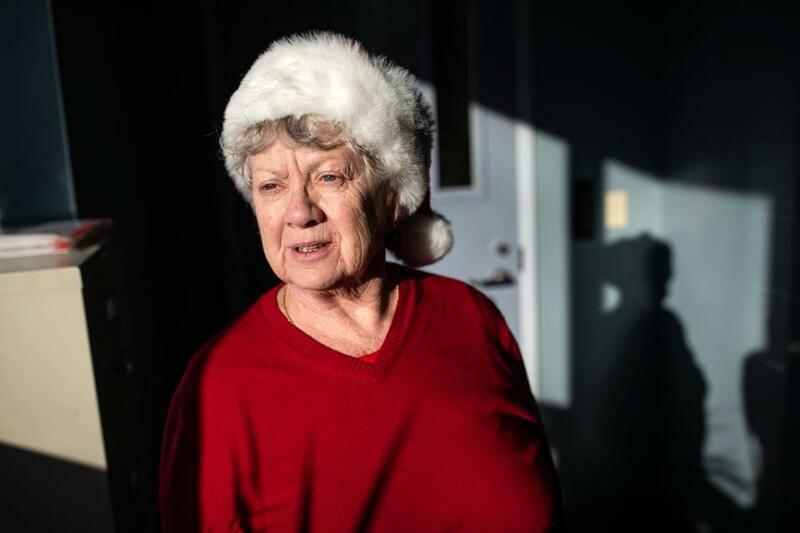 AMESBURY — Beverly Daigle arrived at the local senior center last week in dangling red earrings and a Santa hat. But unlike the folks upstairs fashioning Popsicle sticks into reindeer ornaments, or those who’d gathered earlier to hear a dramatic reading of “A Christmas Carol,” she’d come to attend a support group for seniors struggling with depression. The holidays conjure up memories for Daigle, 77, who lives over the border in South Hampton, N.H. Years ago, she hosted Christmas Eve gatherings for about 25 people. “I had my husband, three children, two dogs, and two cats — and if someone didn’t have a place to go, they’d come to my place,” she recalled. That was before her husband, Norman, died, and her kids grew up and moved away. This year she plans to spend Christmas with a friend. For nearly a third of Massachusetts residents, and more than a quarter in New England, old age is shadowed by depression. A report released this month by the Gerontology Institute of the John W. McCormack Graduate School of Policy and Global Studies at the University of Massachusetts Boston shows the share of state residents over 65 who’ve been treated for depression has climbed to 31.5 percent from 28.6 percent three years ago. The report, which compiles a broad range of aging health data culled from Medicare records, was funded by the Tufts Health Plan Foundation. Depression diagnoses span a range of severity, from mild seasonal affective disorder to major depressive disorder, where people can become suicidal, stop eating, or have difficulty getting out of bed, medical professionals say. Doctors typically encourage exercise and engagement with others. In the more serious cases, they prescribe medication or psychotherapy. The Massachusetts depression rate of 31.5 percent — measuring the share of Medicare recipients who were ever diagnosed with depression — was slightly higher than the rates of just under 30 percent for Connecticut, New Hampshire, and Vermont. The incidence of depression among seniors was a bit higher in Rhode Island (32.6 percent) and Maine (33.7 percent). The report didn’t include data for other states. Researchers from the Gerontology Institute at UMass Boston attributed the rise in the state depression rate in part to better health screening, which has helped them diagnose cases that might have been missed in the past. They also suggested that the baby boomers who are now migrating into Medicare feel less of a stigma than older seniors about seeking treatment. But the overall prevalence of depression in seniors is linked to broader factors such as loneliness, financial hardship, and chronic disease, the researchers said. They cited the changes and losses that accompany aging, the search for new meaning when people’s working lives end, and the pressures of growing old in one of the nation’s most expensive states. “We’ve never had so many people expected to live so long, and there’s a lot of stressors that pose a threat to their well-being,” said lead researcher Beth Dugan, associate professor of gerontology at the UMass McCormack Graduate School of Policy and Global Studies. 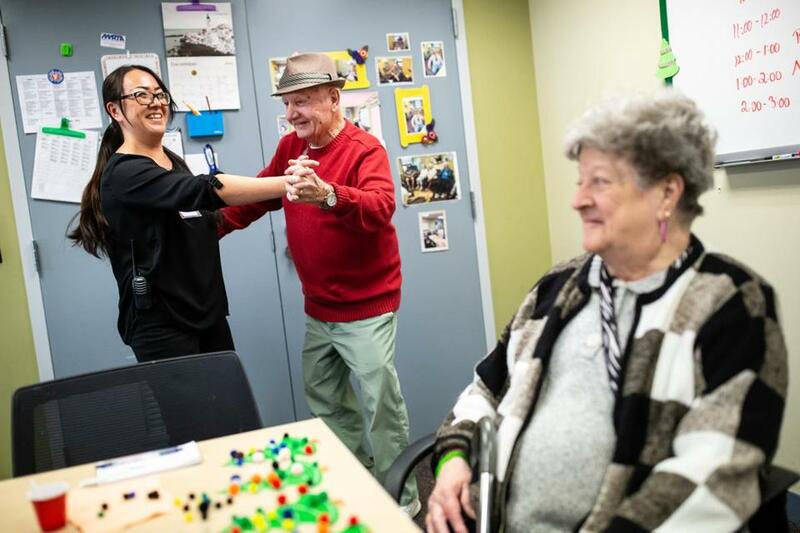 Ron St. Jean, 82, shakes off the blues by dancing with activities leader Ayako Tarbell while Sandra Kowalski, 77, makes crafts at the Amesbury Senior Community Center. Merrimac resident Ron St. Jean, 82, who was making crafts at the Senior Community Center in Amesbury this week, is a musician who plays the keyboard and sings everything from rhythm and blues to country-western tunes. But he fell into depression for a time after having triple bypass heart surgery five years ago and being diagnosed with macular degeneration a year later. He now wears a pacemaker and uses a magnifying glass to read music. “When they told me that I was going blind, I wanted to commit suicide,” he said, “but I couldn’t do it. I was sitting at home every day thinking about this going-blind stuff.” Later, as he began visiting the senior center and socializing with others who had chronic health conditions, his outlook gradually improved. “I realized it’s really not so bad,” he said. For clinicians and social workers on the front lines, the UMass findings reflect what medical professionals have been seeing for years. Cassie Cramer, a community social worker for Somerville-Cambridge Elder Services, said Massachusetts seniors are coping with everything from negative perceptions of older people to unstable housing situations. “The rising cost of housing has meant that people can’t live in their homes anymore,” she said. Many also grapple with a sagging sense of their value to others after they retire, Cramer said. She said they come to accept “ageist” beliefs linking productivity to self-worth. Social workers see differences in depression triggers for the “younger old,” who more recently crossed the age 65 threshold, and the “older old,” who are in their 80s or 90s. Some baby boomers are grappling with the opioid crisis, part of a cheerless battalion of older adults who’ve had to bury children who’ve overdosed or raise grandchildren themselves. And many older seniors, she said, chafe at the accelerating pace of life in the 21st century, having come of age in a slower-moving era, said Betsy Connell, director of behavioral support programs at the Massachusetts Association of Councils on Aging. Medical professionals are not only doing a better job of identifying depression, but their attitudes about treating it in older residents also have evolved, said Dr. Jason Strauss, director of geriatric psychiatry at Cambridge Health Alliance. “It used to be thought that, ‘You’re old, depressed, what do you have to live for?’ ” said Strauss, who treats dozens of patients a week, ranging in age from 60 to 96, at his offices in Everett and Somerville. “There used to be a social stigma that older adults, because they’re not working, are no longer useful. Some who experience depression say it comes and goes, and they show remarkable resilience. St. Jean, the musician, finds meaning playing his keyboard at free concerts at an assisted living home in Newburyport. He also helps the Amesbury senior center staff by setting up chairs and tables for events and dressing as Santa for a visiting kindergarten class. After her husband died, Daigle, the woman in the Santa hat, spent years toiling at multiple jobs — baby sitting, dog sitting, working maintenance at a dog track, cleaning a trailer for a road paving company — to hold onto her home and raise her children. She’s retired now, but swims four times a week, attends church twice a week, takes computer classes at a vocational school, and goes to dinner dances with her friends. “If someone says, “Do you want to go out?’ I’m up for it,” she said.